The stainless steel double door compact floor standing enclosure range, EKDS, with a IP 55 protection degree is ideal for installation in confined spaces where a single door. when opened, would take up too much space in front of the enclosure. The doors' loading capacity also increases as it is divided over two doors. With an IP 55 protection degree, components inside the enclosure are well protected and makes the it well suited for almost any environment, grade dependant. AISI 304L pre-grained stainless steel / AISI 316L. Body and removable rear panel: 1.5 mm. Door: 2 mm. Bottom Plates: 1.5 mm. Mounting plate: 3 mm. One piece enclosure body. Integrated depth profiles with hole pattern allowing mounting plate adjustable in depth. Surface mounted with 4 hinges including door frame with 25 mm hole pattern and earthing studs. Standard doors can not be reversed. Fitted by M6 torx screws. Standard facilities for rear door mounting. Split rear panels in 1600 mm wide enclosures. Espagnolette 4-point locking system in the main door and 2-point locking system in the slave door. Standard double-bit lock with 3 mm insert. Standard inserts, cylinders, lift handles and T-handles are available as accessories. One piece bottom plate with injected polyurethane gasket to ensure maximum sealing. Door is equipped with separate welded earthing studs and earthing to the frame can be accomplished by using the ECF. Double folded and slides into position. Adjustable in depth by steps of 25 mm. Mounting plate is supplied, attached on the outside of the enclosure packaging. Fitted inside for 1600 mm wide enclosures. For 1600 mm wide, filler plate is included. Double door version, complies with IP 55 | TYPE 12, 13 | IK 10. Individual doors with welded vertical divider, complies with IP 66 | TYPE 4X, 12 and 13 | IK 10. One piece body with fitted door and rear panel, bottom plates and mounting plate, including door earthing studs. Delivered on a pallet which is identical to the width of the enclosure to allow suiting without removal. Mounting plate is attached to the outside of the enclosure packaging. All the packing material is recyclable. 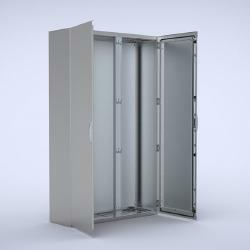 Stainless steel 304 and 316(L) double door compact floor standing enclosures, with a IP 55 protection degree. The space required immediately in front of the enclosure is reduced due to the width of each enclosure door being half that of the enclosure. This also results in the door's loading capacity being higher, as it is split over two doors. The installed components inside the enclosure will be safe and secure due to the high protection degree. Large enclosures can be installed in areas where there is limited access space. The enclosure's doors can support heavy loads, such as, cooling units, due to its increased loading capability. Component failure and unnecessary downtime is avoided as water and dust are prevented from entering the enclosure. Stainless steel enclosures can be installed in almost any environment, grade dependent. Stainless steel 304 double door compact floor standing enclosures, with a high IP 66, TYPE 4X, protection degree, are also available.